Multiple myeloma (MM) accounts for approximately 1% of all cancers and around 10% of hematological malignancies [1, 2]. Although overall survival has improved over the last decade, based on the availability of various novel drugs and treatment options, MM essentially remains an incurable disease. Chemokine (C-X-C motif) receptor 4 (CXCR4) has been described to play a pivotal role in tumor growth and progression, tumor invasiveness and metastasis . Overexpression of the receptor has been reported in more than 30 different types of cancer [4-7]. CXCR4 activation has been shown to correlate with MM-related bone disease [8, 9]. Additionally, the interplay between receptor and its ligand stromal derived factor 1 (SDF-1α/CXCL12) serves as a stimulator of plasma cell proliferation . Recently, a radiolabelled CXCR4-ligand ([68Ga]Pentixafor) for PET imaging has been developed [10, 11]. Dosimetry and proof-of-concept for visualization of CXCR4-expression could be demonstrated in patients with multiple myeloma and other hematologic and solid malignancies [12-15]. A pilot study further proved the feasibility of CXCR4-directed radionuclide therapy as a novel treatment approach for MM . In this study, we aimed to further evaluate the performance of [68Ga]Pentixafor-PET/CT in comparison to [18F]FDG-PET/CT, serving as reference. Additionally, we correlated in-vivo CXCR4 expression with cytogenetics and serum markers of diseases activity. [68Ga]Pentixafor was administered on a compassionate use base in compliance with §37 of the Declaration of Helsinki and The German Medicinal Products Act, AMG §13 2b and in accordance with the responsible regulatory body (Regierung von Oberfranken, Bavaria, Germany). All patients had exhausted all alternative treatment options and underwent CXCR4-directed imaging for endoradiotherapy evaluation. All subjects gave written informed consent prior to [68Ga]Pentixafor PET/CT. 35 patients (23 males, 12 females, age 44-82 y, mean, 62±8.5 y) with a history of MM were included. All patients had been pre-treated with a number of various chemotherapeutic drug regimens including novel agents such as bortezomib, lenalidomide and others. 28/35 subjects had undergone autologous stem cell transplantation (SCT) before. At the time point of PET/CT scanning, serum free immunoglobulin light chains (FLC; all patients) and the M gradient (all patients) were recorded. Serum chemistry including lactate dehydrogenase (LDH), albumin, creatinine (all patients) and β2-microglobulin (27/35 patients) were obtained. Additionally, interphase molecular cytogenetics based on fluorescence in situ hybridization (FISH) were available in 21/35 patients. Presence of del(17p), t(4;14), t(14;16), t(14;20) and chromosome 1 abnormalities were considered as high-risk, whereas all other karyotypes were classified as standard risk. [68Ga]Pentixafor was prepared as previously described . In short, all syntheses were performed in a fully automated, GMP-compliant procedure using a GRP® module (SCINTOMICS GmbH, Germany) equipped with a disposable single-use cassette kit (ABX, Germany). The eluate (68Ga3+ in 0.6 M HCl) of a 68Ge/68Ga-generator (iThemba Labs, Faure, South Africa) was transferred to a cation exchange cartridge, eluted with 5 N NaCl, added to a solution of 40 µg Pentixafor (Scintomics, Fürstenfeldbruck, Germany) in HEPES-buffer and heated for 6 minutes at 125 °C. The product was immobilized on a SepPak C18 cartridge, washed with water und eluted with ethanol/water 50/50. The eluate was passed through a sterile filter (0.22 µm) into a sterile vial und diluted with phosphate buffer solution to a total volume of 15 mL. Radiochemical purity was determined by gradient high performance liquid chromatography and thin-layer chromatography. Additionally, the product was also tested for ethanol content, pH, radionuclide purity, sterility, and endotoxins. [18F]FDG was synthesized in house with a 16 MeV Cyclotron (GE PETtrace 6; GE Healthcare, Milwaukee, USA). All PET scans were performed on a dedicated PET/CT scanner (Siemens Biograph mCT 64; Siemens Medical Solutions, Germany) within two weeks. Before acquisition of [18F]FDG-PET/CT scans (19/35 patients), patients fasted for at least 6 h prior to injection of [18F]FDG. Blood glucose levels were < 160 mg/dl. Prior to [68Ga]Pentixafor PET/CT imaging (all patients), no fasting was necessary. Imaging was performed after a median of 60 minutes (range, 55-64 minutes) after injection of 43 to 165 MBq (median, 133 MBq) of [68Ga]Pentixafor and 256 to 340 MBq (median, 299 MBq) of [18F]FDG, respectively. Corresponding CT low-dose scans for attenuation correction were acquired using a low-dose protocol (20 mAs, 120 keV, a 512 × 512 matrix, 5 mm slice thickness, increment of 30 mm/s, rotation time of 0.5 s, and pitch index of 0.8) including the base of the skull to the proximal thighs. Consecutively, PET emission data were acquired in three-dimensional mode with a 200 × 200 matrix with 2-3 min emission time per bed position. After decay and scatter correction, PET data were reconstructed iteratively with attenuation correction using a dedicated software (Siemens Esoft, Siemens, Erlangen, Germany). For [18F]FDG, criteria to define lesions as PET-positive were applied according to Zamagni et al. . For [68Ga]Pentixafor, lesions were visually determined as focally increased tracer retention as compared to surrounding normal tissue or contralateral structures. Presence and number of intra- and extramedullary (EMD) disease as well as location of lesions were recorded. Analysis both on a patient and a lesion basis was performed. SUVmax of the hottest intra- and extramedullary lesion was measured. Statistical analyses were performed using PASW Statistics software (version 22.0; SPSS, Inc. Chicago, IL). Quantitative values were expressed as mean ± standard deviation or median and range as appropriate. Comparisons of related metric measurements were performed using Wilcoxon-signed rank test. The Chi square- or Fisher exact test was conducted for comparison of frequency data between independent subgroups. For bivariate correlation analyses, Spearman or Pearson correlation coefficients were calculated. All statistical tests were performed two-sided and a p-value < 0.05 was considered to indicate statistical significance. No correction for p-values was applied to adjust for multiple tests. All patients presented with advanced, active MM. High-risk cytogenetics were documented in 10/21 (47.6%) subjects. Serum FLC ranged from 0.5 to 18.556.0 mg/l (median, 395.8), ß2m from 1.8 to 33 (median, 5.7) and M gradients from 0 to 52.7 g/dl (median, 0). Albumin levels were decreased (<3.5 g/dl) in 8/35 (22.9%) patients. Serum creatinine was increased (>1.2 mg/dl) in 13/35 (37.1%) subjects and LDH in 17/35 (48.6%). Patients´ characteristics are summarized in Table 1. [68Ga]Pentixafor-PET was visually positive in 23/35 patients (65.7%, example given in Figure 1). In the remaining 12 subjects with serologically active disease, no relevant expression of CXCR4 could be recorded. 8/23 (34.8%) CXCR4-positive patients presented with disease confined to the bone marrow compartment (intramedullary lesions), 13/23 (56.5%) patients suffered from both intra- and extramedullary disease and the remaining 2/23 (8.7%) patients had exclusively extramedullary MM manifestations (EMD). Hence, 65.2% (15/23) of [68Ga]Pentixafor-PET-positive patients presented with extramedullary manifestations. Regarding EMD, soft tissue involvement was most commonly seen (12/15, 80.0%), followed by manifestations in lymph nodes (7/15, 46.7%), liver (3/15, 20.0%), testis (2/15, 13.3%) and lungs (1/15, 6.7%). Regarding intramedullary MM, 18/21 CXCR4-positive patients (85.7%) showed involvement of the appendicular skeleton, with 11/18 (61.1%) also presenting with EMD. CXCR4 negativity turned out as a positive prognostic factor: In the group of patients with a negative [68Ga]Pentixafor-PET scan, median OS was not reached (vs. 181±41 d in PET-positive patients; p=0.022, Figure 2). TTP tended to be longer in [68Ga]Pentixafor-PET negative subjects (123±42 d vs 53±5 d; p=0.11). Display of a patient (patient #33) with MM Ig A λ and rising free serum light chains. [68Ga]Pentixafor-PET depicts intense tracer uptake in multiple intramedullary (stars) as well as extramedullary (arrows) lesions. Prognostic impact of [68Ga]Pentixafor-PET/CT positivity, presence of [68Ga]Pentixafor PET/CT-positive lesions in the appendicular skeleton and EMD on overall survival. Given are the cumulated survival (y-axis) and the overall survival (in days; x-axis) for various scenarios of CXCR4+ PET/CT findings. Of the 21/35 (60.0%) patients who presented with focal intramedullary PET-positive lesions, [68Ga]Pentixafor-PET detected less than 20 intramedullary lesions in 8/21 (38.1%) and more than 20 intramedullary lesions in 13/21 (61.9%) patients. Of note, 8/13 (61.5%) subjects with extensive intramedullary disease also exhibited extramedullary myeloma involvement. Presence of [68Ga]Pentixafor-PET positive intramedullary lesions tended to be associated with shorter OS (181±53 d vs. OS not reached in patients without IMD; p=0.085) and TTP (58±7 d vs. 102±31 d; p=0.311). A rising number of intramedullary lesions had no significant impact on TTP or OS. Interestingly, involvement of the appendicular skeleton proved to be associated with significantly shorter OS (181±119 d vs. 470±178 d; p=0.038; Figure 2) and TTP (58±6 d vs. 102±23 d; p=0.159). Presence of CXCR4-positive EMD was associated with both shorter TTP (49±4 d vs. 105±23 d in EMD negative patients; p=0.018) and OS (169±36 d vs. not reached; p<0.0001; Figure 2). Of note, the number of EMD lesions had a prognostic value, regarding both TTP (p= 0.055) and OS (p<0.001): Patients with <20 lesions (8/15; 53.3%) patients had a significantly better outcome (TTP 49±8 d; OS: 169±25 d) than those with >20 focal lesions (7/15; 46.7%) (TTP 41±39 d; OS 50±51 d). 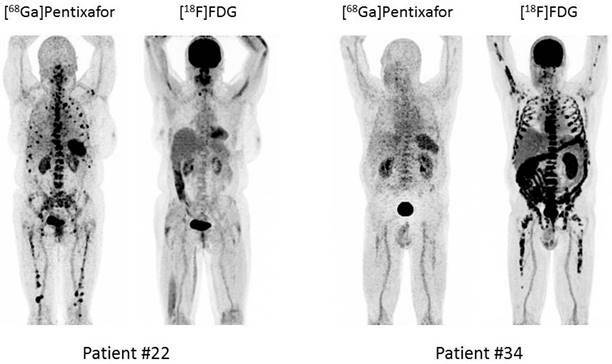 In the 19 subjects undergoing both [68Ga]Pentixafor- and [18F]FDG-PET, both [68Ga]Pentixafor and [18F]FDG were positive in 11/19 (57.9%) patients; 4/19 (21.1%) patients were negative in both scans (Table 2). [18F]FDG-PET positivity correlated with [68Ga]Pentixafor-PET positivity (p=0.018). 3/19 (15.8%) patients were missed by [68Ga]Pentixafor-PET (CXCR4-/FDG+; patients # 4, 21, 31). Of these patients, #21 and #31 presented with extensive IMD (>20 FL) with involvement of the appendicular skeleton. Additionally, patient #21 had EMD with soft tissue involvement. MM was confined to the bone marrow (<10 FL) in patient #4. The single patient (1/19, 5.3%; patient #22) who was missed by FDG-PET (CXCR4+/FDG-) presented with extensive IMD in the appendicular skeleton (>20 lesions; Figure 3). Imaging with [68Ga]Pentixafor demonstrated more focal lesions than FDG in 4/19 patients (21.1%), whereas FDG identified more focal lesions in 7/19 cases (36.8%) with 3/7 (42.9%) being CXCR- and the remainder presenting with a mixture of both CXCR4+ and CXCR4- disease. Diagnostic Performance of [18F]FDG and [68Ga]Pentixafor (n=19). Given are the positive-findings of the patient-based and lesion-based analysis of [68Ga]Pentixafor- and [18F]FDG-PET/CT, respectively. EMD = extramedullary disease; FL = focal lesion; LN = lymph node. Example of heterogeneity of [18F]FDG uptake and CXCR4 expression. Display of two patients with MM LC κ (patient #22) and MM Ig G κ (patient #34), respectively. Both patients present with metabolically completely different forms of disease. In the remaining 8 patients, an equal number of MM manifestations (identical lesions) were detected with both tracers. Most of the lesions exclusively identified by [18F]FDG located at extramedullary sites (7/7; 100%) predominantly in the soft tissue (4/7, 57.1%) and in the appendicular skeleton (4/7; 57.1%). Most lesions exclusively identified by [68Ga]Pentixafor located at EMD sites in 2/3 subjects (with 2/3 [66.7%] in soft tissue und 1/3 [33.3%] in lymph nodes) and at the peripheral bone in the remaining patients. However, in one of these patients (patient #13), 2 pulmonary lesions (identified by [18F]FDG) were missed with [68Ga]Pentixafor. SUVmax of the hottest CXCR4 positive intramedullary lesions ranged from 4.1 to 57.4 (median, 16.4), maximum uptake of the hottest CXCR4 positive extramedullary lesion from 5.0 to 67.1 (median, 14.9). In comparison, SUVmax of the hottest intramedullary lesions in FDG images ranged from 3.8 to 40.1 (median, 11.6), maximum FDG-uptake of the hottest extramedullary lesion from 5.0 to 37.7 (median, 9.0). OS and TTP did not differ significantly if patients were stratified based on the median uptake of CXCR4- and FDG-positive intra- and extramedullary lesions. [68Ga]Pentixafor-PET positivity was independent from all laboratory parameters investigated including LDH, albumin, creatinine, ß2M, M gradient or the level of free serum light chains as well as the cytogenetic risk profile and myeloma type. This is one of the first investigations indicating that expression of the chemokine receptor 4 (CXCR4) is a frequent event in multiple myeloma (MM) and can be non-invasively assessed by PET/CT and the CXCR4-directed radiopharmaceutical [68Ga]Pentixafor. About two-thirds of patients with advanced disease show multiple, CXCR4-expressing myeloma lesions. Moreover, previously unknown manifestation sites could be visualized in 21% of patients using this innovative imaging modality. This result is in line with a recent in-vitro analysis reporting CXCR4 overexpression on the cell membrane of myeloma cells in 56% of cases . In our cohort, CXCR4-positivity was independent from myeloma subtype, M protein and free serum light chain levels or presence of high-risk cytogenetics. Of note, CXCR4 expression of MM proved as a significant predictor of shorter TTP and OS. As expected, presence and extent of CXCR4+ EMD was associated with pronouncedly reduced survival. In comparison to [18F]FDG serving as reference, [68Ga]Pentixafor-PET proved superior or equal to [18F]FDG regarding sensitivity for detecting MM lesions in 63% of cases. Interestingly, 3/19 (16%) patients were CXCR4-negative despite metabolically active disease, as identified by FDG-PET. 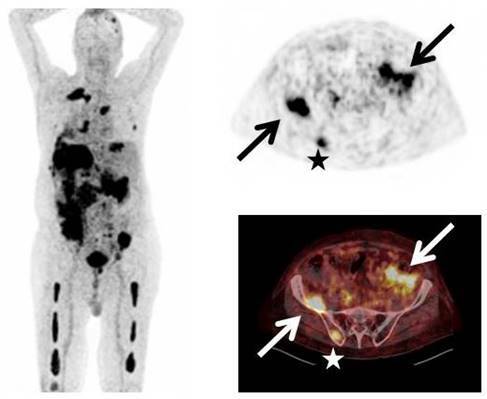 In the remaining 4/19 (21%) subjects receiving imaging with both PET tracers, an intra-individual heterogeneity of receptor expression was noted with a mixture of both CXCR4+ and CXCR4- lesions. The biologic implications of this finding are not fully understood yet. One hypothesis speculated on potential inferiority of [68Ga]Pentixafor-PET in extramedullary disease due to reduced CXCR4 expression and its critical role in cell homing [18, 19]. Another recent publication hinted at a special role of CXCR4 in the acquisition of an epithelial-to-mesenchymal transition-like phenotype, which promotes MM cell dissemination . Given the fact that metabolic PET tracers including [11C]methionine, [11C]acetate and/or [11C]choline have been shown to be more sensitive than [18F]FDG [21-24], intra-individual differences of lesional chemokine receptor expression may even be more pronounced and should be assessed in direct head-to-head comparison trials (including biopsy samples of lesions with divergent uptake of the various tracers). Regarding visualization of extramedullary disease in general, both [68Ga]Pentixafor and [18F]FDG performed equally well. Interestingly, we were able to identify patients with exclusively [18F]FDG- as well as [68Ga]Pentixafor-avid extramedullary disease, respectively. Positivity for CXCR4, especially at EMD sites, proved to be as powerful a prognostic factor as [18F]FDG. Since the prognostic value of metabolic PET tracers like [11C]methionine or [11C]choline has not been established yet, a combination of different makers of glucose and amino acid metabolism as well as receptor surface expression might yield new insights into myeloma biology and should preferably be combined with histological analysis of genetic profiles . In our cohort, the majority of heavily pre-treated patients qualified for CXCR4-directed therapy with a therapeutic counterpart allowing for labelling with both α- and β-emitters (90Y- or 177Lu-labelled Pentixather). Proof-of-concept in advanced stage MM patients could recently be demonstrated by our group . Of note, CXCR4-directed treatment is only performed if the whole tumor cell compartment can be targeted by endoradiotherapy (ERT). Since pronounced intraindividual heterogeneity of receptor expression in different lesions can occur, we generally obtain an additional [18F]FDG-PET scan as reference for viable myeloma lesions and to exclude CXCR4-negative lesions which cannot be effectively treated by ERT. A prospective, multi-center trial in Germany will further evaluate the feasibility and benefit of radionuclide therapy in MM (COLPRIT, Eudra-CT 2015-001817-28). Additionally, anti-CXCR4 therapies using non-radioactive agents, such as BMS-936564/MDX-1338, a fully human anti-CXCR4 antibody, are currently under clinical investigation . Given the increasing significance of multi-modal treatment approaches, combinations of novel agents, conventional chemotherapy or other receptors which are highly expressed in MM (e.g. CD38, SLAMF7, CD40) and radionuclide based therapies can be speculated on to yield synergistic effects and raise the hope for even more effective individualized treatment in the future. Yet, little is known about the influence of conventional chemotherapeutic drugs and/or novel agents on CXCR4 surface expression and regulation. Initiation of potent treatment regimens can rapidly downregulate CXCR4 and thereby severely hamper receptor-directed therapies . Further analysis of regulators depressing or enhancing CXCR4 surface density is therefore urgently needed. The data presented have several limitations. In this cohort, [68Ga]Pentixafor-PET/CT imaging has been performed on a compassionate use base. Hence, this study has to be considered as a retrospective analysis, which comprises only a limited number of patients and is -due to its retrospective nature- prone to selection bias. Furthermore, not all patients received imaging with both radiotracers, preventing a more detailed comparison of the performance of [68Ga]Pentixafor compared to the clinically used radiotracer [18F]FDG. Also, not all positive MM lesions, especially extramedullary manifestations, were histologically proven. Therefore, there might be a false positive rate, e.g. regarding lymph node involvement. Distinct biological features of MM lesions presenting as CXCR4+/FDG- and vice versa were not investigated. It is not clear if - and to which extent - individual treatment decisions based of PET/CT imaging might have influenced patients' overall prognosis. It can be hypothesized that switching a patient to a more intensive treatment regimen based on PET/CT findings might have resulted in more favourable outcomes. Treatment-induced bias due to heterogeneous treatments at relapse cannot be excluded in this series and may account for some of the prognostic differences that were found. The prognosis of lesions displaying high [68Ga]Pentixafor and low [18F]FDG uptake and how these lesions respond to current treatments has not been clarified yet. Further prospective studies also regarding the prognostic value of CXCR4-expressing disease in terms of therapy monitoring are highly warranted. In conclusion, [68Ga]Pentixafor-PET enables non-invasive detection of CXCR4 expression which occurs frequently in multiple myeloma. Our data suggest that CXCR4 expression represents a negative prognostic factor and is a potential target for myeloma specific treatment. Additionally, in a significant proportion of patients (21%) previously unknown myeloma lesions have been detected. Currently, selecting patients for CXCR4 directed therapies and prognostic stratification seem to be more relevant clinical applications than diagnostic imaging of myeloma. This publication was funded in part by the Wilhelm-Sander-Stiftung (grant no. 2013.906.1). HJW is founder and shareholder of Scintomics. SK is CEO of Scintomics. All other authors declare no conflicts of interest. Corresponding author: Constantin Lapa, MD, University Hospital Würzburg, Department of Nuclear Medicine, Oberdürrbacher Str. 6 ,97080 Würzburg, Germany. Email: Lapa_cde.